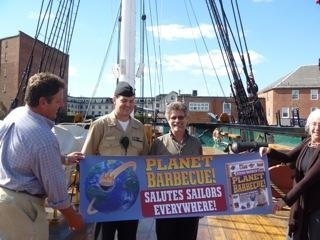 It was a perfect fall day recently as Steven and Workman Publishing fired up the grills in a Planet Barbecue salute to the crew of the USS Constitution. The party took place in the Charlestown Naval Yard overlooking Boston Harbor in Charlestown, Massachusetts. 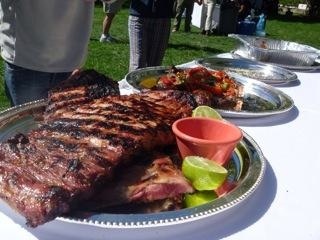 The menu included Cambodian Ribs (above), Caveman T-Bones, Shrimp on the Barbie, Cambodian Grilled Corn, and Cactus Pear Crisp. 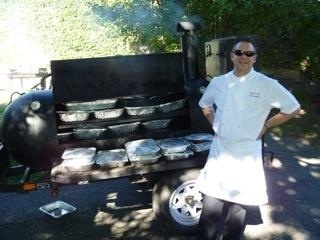 Steven’s recipes were prepared by chef Andy Husbands, a former Grand Champion of the prestigious Jack Daniels Invitational barbecue contest, currently of the restaurant 647 Tremont in Boston’s South End. 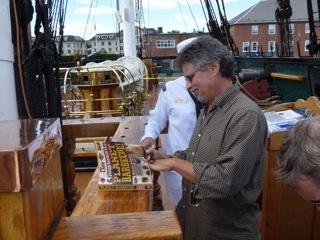 Here, Steven autographs a copy of Planet Barbecue for a sailor on one of the first frigates commissioned by the U.S. Navy, “Old Ironsides”. 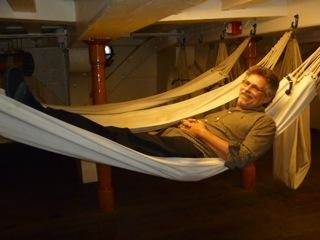 Taking a rest on one of the ship’s belowdecks hammocks.